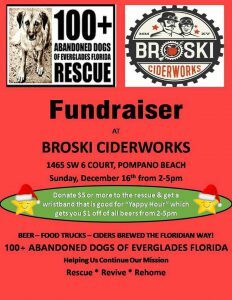 Broski Ciderworks Fundraiser | 100+ Abandoned Dogs of Everglades Florida, Inc.
It’s a fundraiser at Broski Ciderworks on December 16th from 2-5pm. Your generous $5 donation will get you a bracelet that is good for $1 off all beers during this event. Come out and have fun at a great place and help us continue our mission to rescue, revive & rehome so many in need. See you all there!